My book is on Kindle! Though I dragged my feet initially, last month I joined the legions of enthusiastic ebook readers — as a reader and a writer. When my son surprised me with a Kindle for my birthday, I was immediately impressed at how handy and economical it is. Whether I’m sitting in a medical waiting room with my mother or traveling on vacation, I’ve got a mini electronic library that fits in my purse. Best of all, I downloaded Thoreau’s Walden for free, and found that e-reader versions of bestsellers are cheaper than the print editions. 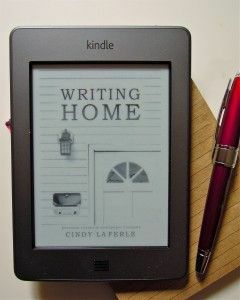 Of course, I had to make my own book, Writing Home, available on Amazon’s Kindle store — complete with a new introduction. A memoir of my earlier motherhood years and a tribute to my family, this book is especially dear to my heart and I’m thrilled to make it available to another set of readers. 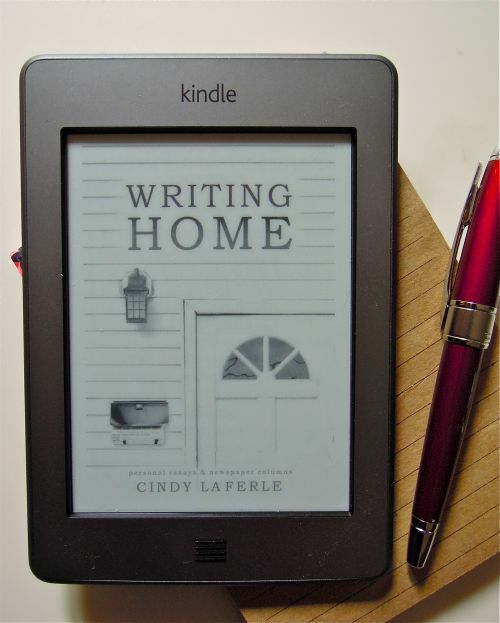 If you’d like to add Writing Home to your own electronic library, this link will take you directly to the book’s page on Amazon. (The paperback edition can be ordered there, too.) You can read sample pages from Writing Home as well as several national and local reviews of the book on Amazon. How about you? Do you use an electronic reader, or do you prefer ink on paper? Rather than send each of you a bunch of black balloons and a silly card with a joke about adult diapers or memory loss, I’m writing you a letter with some advice. There’s no denying that 50 is a landmark birthday. A turning point. The Big One. Over the next few weeks, you’ll be paying more attention to the mirror in your bathroom. Reading your face like a road map, you’ll scrutinize your eyelids and check the skin around your cheekbones. Maybe you’ll notice a couple of age spots that can’t quite pass as freckles. Or wonder why your jawline isn’t as sharp as it used to be. Before I turned 50 (eight years ago), I realized that even my hands were starting to look like a topographical survey. The pale blue veins over my knuckles are more prominent now, and the skin on my face is etched with fine lines and small valleys. But I’m really OK with all of this. Age spots aside, what you’ll notice most after turning 50 is that you become more philosophical, less hurried. You’ll care care more about things that matter in the long run, including deep relationships and good health. You’ll get wise to the marketing tricksters, and you won’t be as influenced by the trendy or the superficial. You might watch a lot less television and read whatever intrigues you, not just the books Oprah endorses or the ones that make the best-seller lists. You’ll start wearing clothes that work for you — not necessarily what’s promoted in fashion magazines. Best of all, you’ll stop seeking approval from others. You’ll trust your own opinions. In years to come, you might start thinking about making a real difference in your community, your world. But awards and accolades won’t interest or impress you quite as much anymore. Before taking on any new assignments or volunteer work, you’ll find yourself pausing to examine your real motivations. At least that’s what happened to me. I wanted to give from the heart, not the ego. To borrow from Thoreau, I wanted to live deliberately. For me, living deliberately has come to mean spending more time with the people I love most, and more time on the projects I love best. So I have to be careful before I say “yes” to anyone or anything else. One of the gifts of middle age is that we finally realize we cannot be all things to everyone. And what a relief that is! Once you’ve crossed the threshold between 49 and 50, you’ll notice — more than ever — that American film directors and magazine editors rarely celebrate the strength, power, and beauty of older women. And the few fashion magazines that do cater to our age group still insist on using models that look closer to 35 than 55. Regardless, resist the foolish temptation to dress like your daughter or your son’s girlfriends. Show younger women what 50 really looks like — and prove that maturity isn’t something to be ashamed of. It helps to have older friends. Older women friends will help you navigate the thornier parts of middle age, including the empty nest and suspicious mammograms. Like senior discounts and a good eye cream, they are definitely worth seeking out. When you find them, cherish them, and listen to what they have to say. Isn’t it a shame that we have to travel through five decades to figure this out? I hope you’ll celebrate this birthday for all the good things it represents, for being a signpost to the richly textured life ahead of you. You are wise and beautiful, and I’m right there with you on this incredible midlife journey. 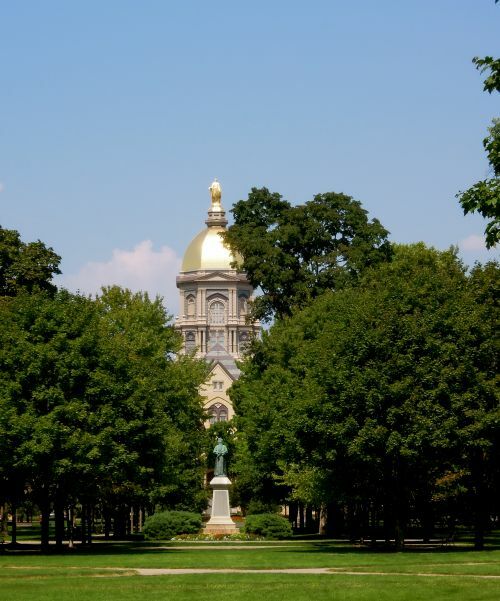 *Part of this essay was excerpted from Writing Home by Cindy La Ferle. 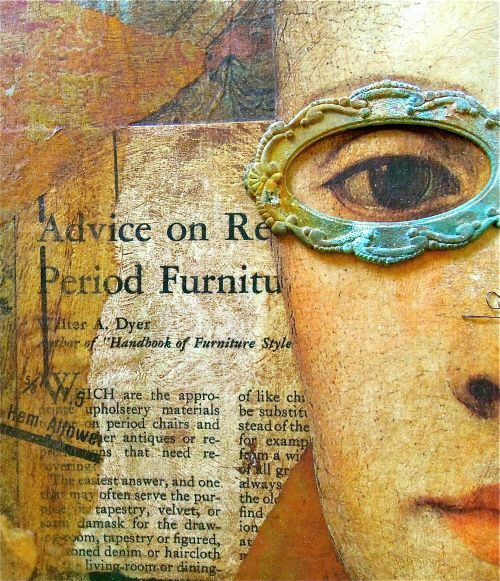 The illustration above is a detail from an altered book, Renaissance Woman, by Cindy La Ferle. I have a hunch that fall will arrive early this year. Maybe its the angle of sunlight on the black-eyed Susans in our perennial garden. Or maybe it’s the snap and crunch of acorns under my tires when I bicycle around the neighborhood. Whatever triggers it, I cant ignore the maternal instinct to shop for back-to-school supplies â€” even though I dont have a student anymore. It’s been four years since my son moved to his own place in Chicago. Yet I still struggle to wrap my mind around the fact that Im officially an empty nester. Even now, I cant fathom how any parent finds the time to juggle it all, no matter how many children she has. In retrospect, Im surprised at how long it took to adjust to the void my son left when he moved into his freshman dorm at college. His bedroom at home looked so eerily clean and empty that I made a habit of keeping its door shut. 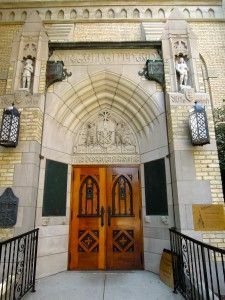 Up until then, I hadnt fully realized that the vocation I’d enjoyed most â€” more than writing or publishing or teaching â€” was mothering. Determined not to become a long-distance helicopter parent, I had to figure out where to devote my maternal energy during this uncharted phase of my middle age. I needed to explore something different â€” something just for myself. Was it time for a puppy or a brand-new hobby? The late-summer ritual of buying school supplies provided my first clue. The week before his big move to college, my son and I headed for the nearest office supply store. 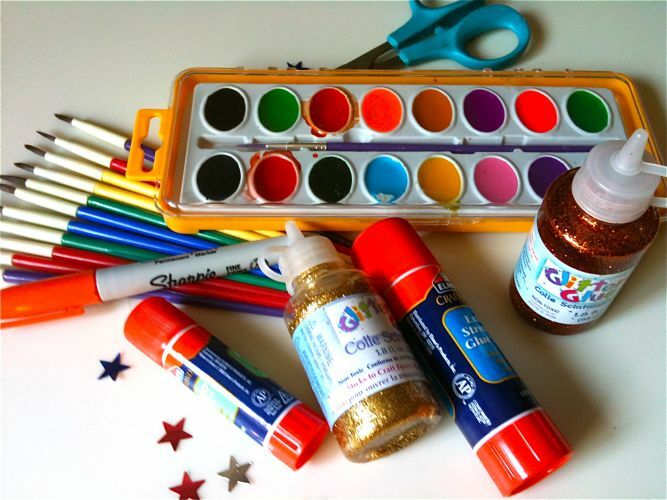 While my son made a beeline for the computer supplies, I was magically drawn to a rainbow display of felt-tipped calligraphy pens, colored markers, glitter glue and drawing pads. And thats when my inner artist â€” whod been banished to a corner of my psyche after I graduated from college â€” finally reasserted herself. I had no idea what she planned do with all the tubes of glitter glue and Magic Markers she tossed in our shopping cart, but she refused to leave the store without them. 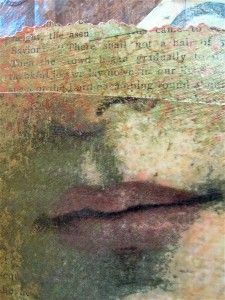 I think author John Updike explained it best when he said, “What art offers is space â€” a certain breathing room for the spirit.” Which is exactly what I needed at the time. A month later, I went shopping for real art supplies at Michael’s craft store, where I also discovered several art magazines featuring how-to articles on mixed-media collage and altered books. I couldn’t learn fast enough. 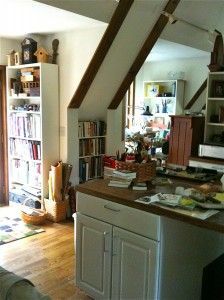 By the end of that fall, Id started clearing space for an art studio upstairs above the garage. While my son studied (and partied) through his freshman year at college, I happily painted, cut, and pasted a whole new path of my own.